Mobile phone is becoming more and more important in our life. We can watch movie, listen to music, play games, take photos and so on. Have you thought to connect mobile phone with VR which is a wonderful match. VR is called virtual reality which is here in the sense, you just need a 3D video, a mobile phone, a VR headset, then you can enter the amazing VR world. You can download the 3D video from Youtube or buy the 3D movie from the professional 3D movies, like Amazon. Best choice is to buy the 3D Blu-ray disc for better enjoyment. Finally, how to get a best mobile phone VR headset? From Amazon? no problem, but there are too many VR headsets on the market, hoe to make the wisdom decision? Following will share best 2017 mobile phone VR headsets with you and hope to help you. 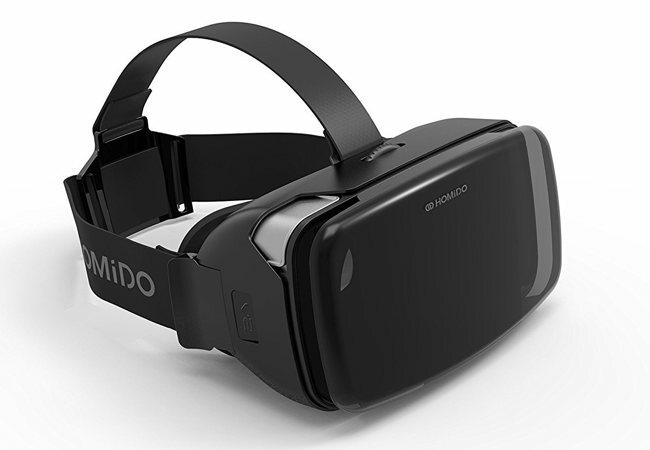 Screen Compatibility: 4" – 5.7"
Homido VR Headset is compatibile with larger mobile phones such as the iPhone 7 and iPhone 7 Plus. Compared to other mobile phone VR headset, the comfortable face plate is popular among people. This mobile phone VR headset offers adjustable lenses and a handy 100° field of view, you can get the special VR enjoyment. Use the Homido on your head and you’ll feel truly immersed in the 3D world. 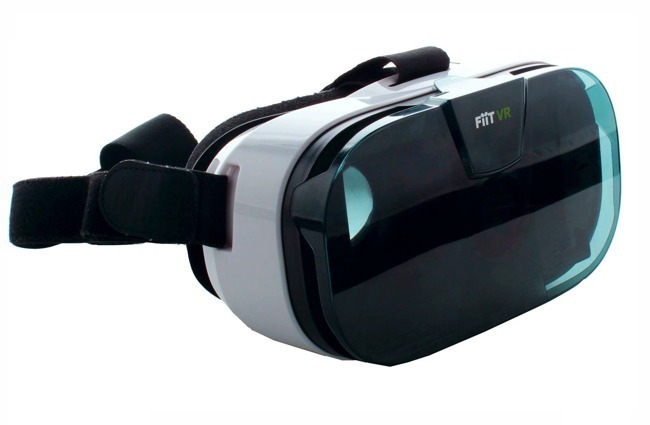 Screen Compatibility: 4" – 6.5"
The Fiit VR Headset field of view is a claimed 102 degrees which you don’t have the tools at your disposal to verify that figure. There is the translucent front panel which can support the growing number of augmented reality apps. And control you can bundle this mobile phone VR headset with a Bluetooth controller on Amazon. 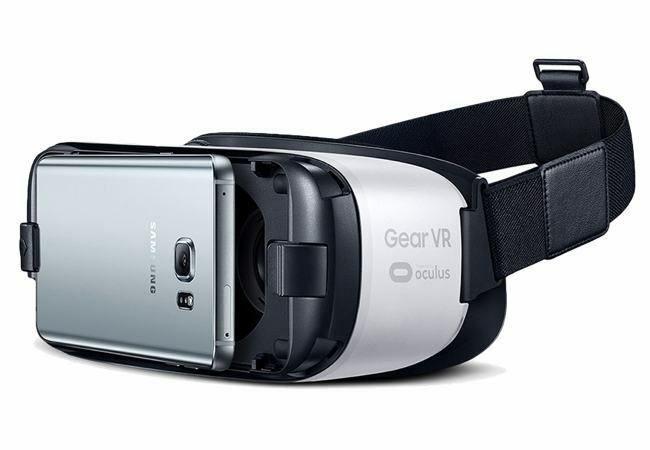 Samsung Gear VR is responsive, well-built unit with crisp visuals. This mobile phone VR headset is designed to work with Samsung’s top flight phones from last year: The Galaxy S6, S6 Edge, S6 Edge +, Note 5, S7 and S7 Edge. All these handsets have one thing in common: Support 2560 x 1440 resolution. Another key difference between the Samsung Gear VR and the other essentially passive headsets is that the Samsung has its own on-board circuitry in the form of an accelerometer, gyroscope and proximity sensors to supplement those of the enclosed smartphone. From above the VR headset price, this VR headset is so cheap, just £19.99, you can deal for Android and iOS owners with a casual interest in mobile VR. The Archos VR glasses support most phones, even boasting enough space for 6-inch screens for gadgets such as the Nexus 6. You’re slightly disappointed there’s no foam padding to keep our nose comfy, but when you factor in the small price tag it’s hard to fault the accessory based on this one omission. Can You Enjoy Movie on Mobile PhoneVR Headset Smoothly? Now, you have a perfect mobile phone VR headset, you also have a movie file, Video formats is various which cause the complicated video compatibility issues. VR headset is set for 3D movies, you can also see the common 2D movie on it, but you can’t experience the 3D effect. Another question is that how you play the 3D Blu-ray movie? As a DVD or Blu-ray fan, watch the 3D Blu-ray on VR headset is so wonderful experience, how to do that? 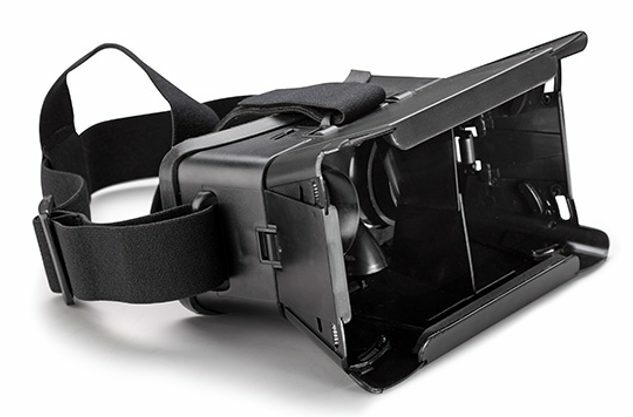 Thankfully, you can have a 3D video converter which can help you to solve the video issue on VR headset. A 3D video converter can convert the common video to 3D video format, also you can load the DVD or Blu-ray movie and change then to VR headset acceptable 3D video that you are not disturbed with the Blu-ray drive. How to choose a perfect 3D video converter from countless softwares? HereI highly recommend you Pavtube Video Converter Ultimate for Windows/Mac which is a professional and easy-to use 3D video converter, you are able to backup, convert and edit 2D common video to 3D video, also you can convert 3D Blu-rays to other formats, such as: 3D SBS MKV or MP4 and enjoy on at homes. Except the perfect conversion function, multiple 3D output formats, like: 3D MKV, 3D AVI, 3D WMV, 3D MOV, 3D MP4. you also can set the 3D video modes, this 3D video converter provides you some choices: Side by Side, Anaglyph, Top/Bottom, you can choose anyone you like. Do you want to know more about this 3D video converter, you can read here. How to Use the 3D Video Converter for Watching 3D movie on iPhone 7 VR Headset? This 3D video converter is easy to install and master, just click the "Trial" button and wait for a while, then you can get a .exe file on your computer, if you are a Mac user, you can get a .dmg file, you don’t uncompress this file, just click it and the magic installation will start, 4 clicks, next, next, next again, the a dream 3D video converter icon appear on your computer. Following is as the 3D DVD as the example and tell you how to use the 3D video converter to convert video and play on smart phone VR headset. Open the 3D video converter, then insert your DVD disc to your computer. Add 3D Blu-ray from disc drive into this software by clicking “Load Disc” button. 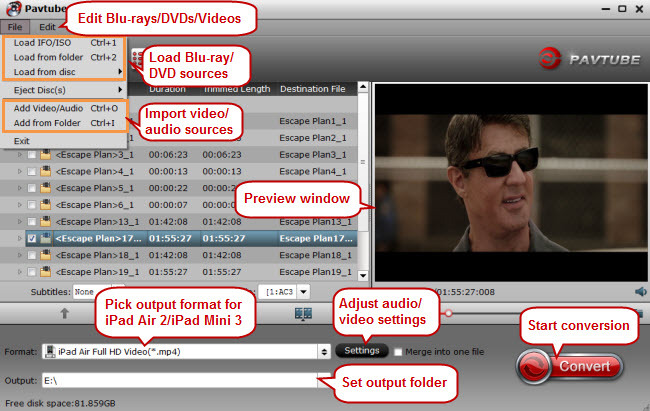 Or you can choose to import DVD ISO image or DVD folder and input then to the 3D video converter. This software can remove all the 3D DVD protection and region code, the load time is just within 1 minute. Step 2: Output 3D output format. Next step is fatal, choose the 3D output format. Move to “Format” menu, you can find “3D Video” category, at this list, you have 5 video formats choices: 3D MKV, 3D AVI, 3D WMV, 3D MOV, 3D MP4, every 3D video format you can choose different 3D modes: Side by Side, Anaglyph, Top/Bottom. For example: Choose “MP4 Side-by-Side 3D Video(*.mp4)” as output format, you can also choose 3D TAB MKV or MP4 format according to your own needs. 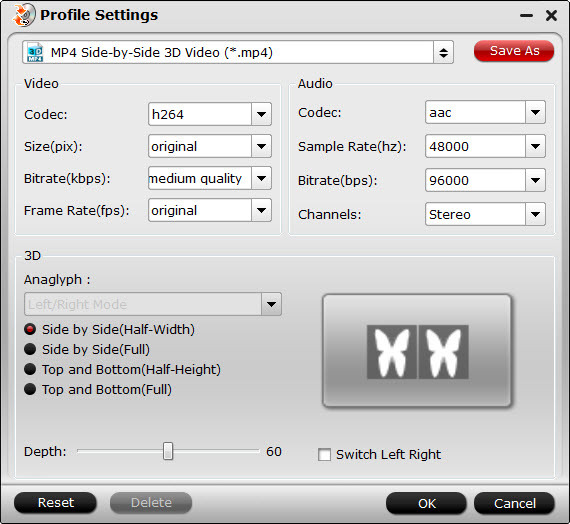 TIP: Click settings to open “3D Profile Settings” window, here you can adjust output 3D video depth, select the specific 3D resolution, 3D video and audio codec, change the 3D video frame, etc. here you can also choose the 3D effect mode: Side by Side (Half – Width) or Side by Side (Full) or change the image display order for 3D SBS movie. Step 3: Start 3D conversion process. Go back to the program main interface, hit on the “Convert” button and start to create 3D SBS or TAB MP4/MKV video from 3D Blu-ray disc. When the conversion is done, you can locate the generated 3D SBS MP4 video in output folder to view on Phone VR headset with seriously immersive 3D effect. Conclusion：When you choose a best phone VR headset, then get a perfect 3D video by the 3D video converter, the input the 3D video to your phone, put the smartphone on the best phone VR headset, you can enjoy your VR at will. if you want to watch the common video on VR, you can follow above steps to do.